Multiple light fixtures operated by a single switch can be most easily wired through a process known as "daisy chaining." This is a simple, serial wiring scheme that connects the wires of the light fixtures one to the next in a single circuit. Daisy chaining is easy in both concept and in execution and is withing the grasp of the do-it-yourselfer who's taking on a remodeling or basement refinishing project. 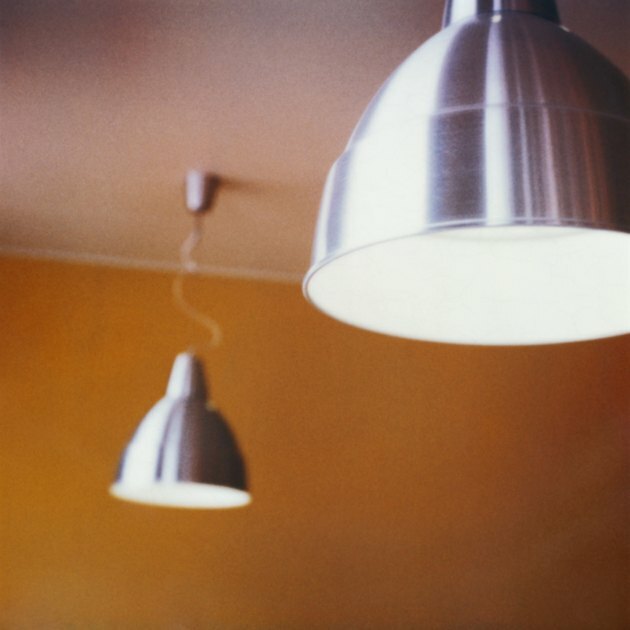 Daisy chaining is a simple way to connect two or more light fixtures. Turn the power off to the circuit you'll be working on at the home's circuit breaker panel. If you're installing new wiring as part of a remodeling job and the circuit is not connected, skip this step. Run a length of 14-2 electrical cable from the first light fixture box to the second light fixture box. If necessary, drill holes in the ceiling joist to run the wire through. If not, attach the cable to the joists with cable staples. Pry open the slots on the side of each light fixture box with a screwdriver and insert the ends of the cables. Leave 6 inches of extra cable extending from each box. Remove 3 inches of the outer insulation from each end of the cables. Remove 1/2 inch of insulation from the ends of the black and white wires inside the cable. Cut a 6-inch piece of cable and remove 2 inches of insulation from each end -- strip 1/2 inch of insulation from the black and white wires on each end. Pair together the black and white white wires from the cable running to the power source; the cable running from the first box to the second box; and the wires on one end of the short piece of cable. Slip wire nuts over the ends of the bare wires and twist until tight. Attach the black and white wires on the open end of the short wire to the lamp's wiring screws or bare wires -- follow the instructions provided with the lamp. Wire the other end of the cable running from the first outlet box to the second outlet box to the second lamp. The two lamps are now daisy-chained on the same circuit.